You have to put some actions behind the words to see the results you wanted, isnt it? The same applies to your hosted WordPress website, especially if you are a beginner. You can’t just expect WordPress to work for you and talk about how great it is. You will see the results faster, and set yourself up for success if you implement those effective and helpful techniques outlined below. Just use some of the following suggestions. Sometimes you are just afraid to open your hall wardrobe, since all the stuff shoved to the top shelf will fall down on your head, aren’t you? Many WordPress sidebars look just the same. They are stuffed with the links to your most recent tweets, your ads, photos of your Facebook fans, social media icons, etc. So a link you would really like your site visitor to click on is buried under all that information, or can even be absent. How can you solve this? Add only the essential information on your sidebar, and delete all unnecessary icons. Remove everything except the widgets that actually do something for your business in your Appearance & Widgets menu. Remove any widget if it doesn’t get someone to take an action you would like them to take, put money in your bank account or add people to your list. Say you have a bunch of magazines. Would it be smart to put the them on the separate shelves by the week they were released? Definitely not. You will find yourself walking from shelf to shelf, looking for the magazine you need. The same thing is your Media Library in WordPress. It is better to create one folder with all your media files: just type a keyword and you will find the file you need within seconds. Go to Settings & Media and uncheck the button next to “Organize my uploads into month-and year-based folders.” to set up your WordPress site the way that all your media files will be put into one single folder. You have created outstanding content for your website and you want Yahoo, Google and Bing to see it on the web? Use short “road signs” that will point to your content to make it easy for these services. Firstly, see the basics of SEO Copywriting, it is not as difficult as it seems. 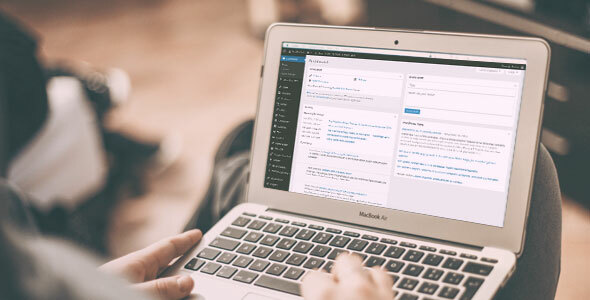 Using the built-in WordPress permalink field at the top of the editing page is the first quick improvement that you can start making immediately. You will get an ability to revise your links before you publish them. Then, make wise use of keywords in your description, and eliminate unnecessary words. Make sure the results are pleasant to read for all people, and don’t stuff it with keywords. You should create a short permalink, which would tell search machines about the content of your post in a glance, and promote keywords you need. When you share your pages and posts on LinkedIn, Google+ and Facebook, these machines pick up a description and page title to go with the shared URL. And when your post appears in a search machine list, the description and title that people see are important for them to make a decision to visit your site. Another important thing for search engines is a page title. The description and title are the key elements on your website! To edit the page description, title and get better control over what appears in these results, use SEO optimization software like Scribe. The descriptions are aimed for visitors. Use a strong call to action to encourage clicks, elaborate on the promise made in your headline and make people enticing. Dont try to cater to Google robots with your descriptions. Images make your pages interesting and beautiful. Also, they can improve your search engine optimization. You have the ability to paste a keyword to your image alternate text and title fields each time you upload an image to your site. When someone hovers over that image, the title tag generates the helpful little text. The alternate text tag is the text they will see in place of your image, if it is unavailable for some reason, or your visitor is using an outdated device. Also, the images need to make sense. If the page is about cars and you are using an image of an old car, don’t call it just “Car.” It is better to call it “Best Cars for Rock`n`Roll” or any other title which will describe what people will actually see in your page. Alternate tag should accurately describe your image. It is a place to make it clear what your site is about, but not a place of pasting random keywords. Grasp your site visitors’ attention with a landing page if you want them to take action. Remove all distractions and unnecessary things. Use a built-in landing page template. It comes with a page with lots of white space to work in and no navigation menu. It will increase the chances your visitors fill in that form and focus their attention on the one action you want them to take, whether it is to follow the link you share or click “Add to Cart” button. The Premise landing page software for WordPress will also be useful if your theme has no built-in landing page or a landing page template. In addition, Premise can help with the an extensive library of images and copywriting advice that will increase your page conversion. Premise works with any WordPress theme. It gives you complete control over content and style without knowing a single line of code and creates versatile landing pages. Sometimes-forgotten footer area is down at the bottom of your website. There you can include an information about who owns your website, a link to an important page, or copyright message. Some premium themes come with an ability to expand the footer area into a full-fledged content section with an opt-in to your email list, links to popular pages or posts, short bio, etc. Don`t forget to continue engaging your visitors in this important space. Give people what they are looking for, when they scroll down to the footer to see who owns a website. Of course, all pieces of advice above are useful. However, it is important to know how to start your website. Good relationships always start with sincerity. The same applies to your website or blog. Just be sincere, and you will always have many grateful readers and clients.